Their verdict: It’s not good, and probably bad. Since the AAP made its original recommendations in 1999, passive entertainment screens — televisions, DVD players, computers streaming video — have become ubiquitous, and the average 12-month-old gets between one and two hours of screen time per day. (Interactive screens, such as iPads and other tablets, are considered in the new recommendations.) The 0- to 2-year age group has become a prime target for commercial educational programming, often used by parents convinced that it’s beneficial. As screens proliferated, so did research. “There have been about 50 studies that have come out on media use by children in this age group between 1999 and now,” said Ari Brown, a pediatrician and member of the AAP committee that wrote the new report. Those studies have found that children don’t really understand what’s happening on a screen until they’re about 2 years old. Once they do, media can be good for them, but until then television is essentially a mesmerizing, glowing box. Used at night, TV might help kids fall asleep, but that appears to come at a delayed cost of subsequent sleep disturbances and irregularities. While the result of TV-induced sleep problems hasn’t been directly studied, poor sleep in infants is generally linked to problems with mood, behavior and learning. At other times, media consumption comes with opportunity costs, foremost among them the silence of parents. “While television is on, there’s less talking, and talk time is very important in language development,” said Brown. Three studies since 1999 have tracked educational television use and language development, and they found a link between increased TV time and developmental delays. 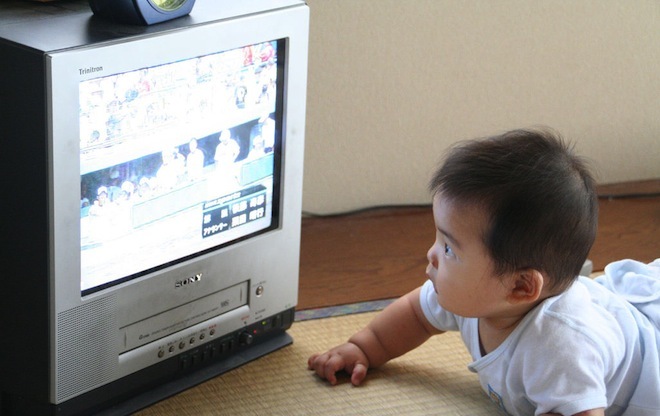 Whether that’s a cause or effect — parents who leave kids in front of televisions might simply be poor teachers — isn’t clear, nor are the long-term effects, but the AAP called the findings “concerning.” In the same vein, there may also be a link to attention problems. Even when media plays in the background, it distracts babies from play, an activity that is known to have deep developmental benefits. And for parents who use media to carve out a few precious, necessary free minutes in busy schedules, Brown recommended letting kids entertain themselves. As for iPads and other kid-friendly interactive computing devises, Brown said research has barely started, much less come to conclusions. But she counseled skepticism of promotional claims, which have been made with some of the same zeal as products of now-dubious standing, such as the controversial Baby Einstein videos. Citation: “Media Use by Children Younger Than 2 Years.” By the American Academy of Pediatrics Council on Communications and Media Executive Committee. Pediatrics, Vol 128 No. 5, November 2011.